Over this summer, the Mannski Family finished off their stay in the United States with a trip to Disneyland. As a child who grew up in Southern California, I spent a good deal of time at the Happiest Place on Earth. As such, I could tell you some of hidden symbols and places that reside in the amusement park, but instead I’ll just link over to snopes.com where they have all the inside dope on the House of Mouse. Hidden is the travel theme this week from Where’s My Backpack? and today we’re going to Disneyland to answer the challenge. Disneyland opened in 1955 and has undergone several renovations and expansions since that time. 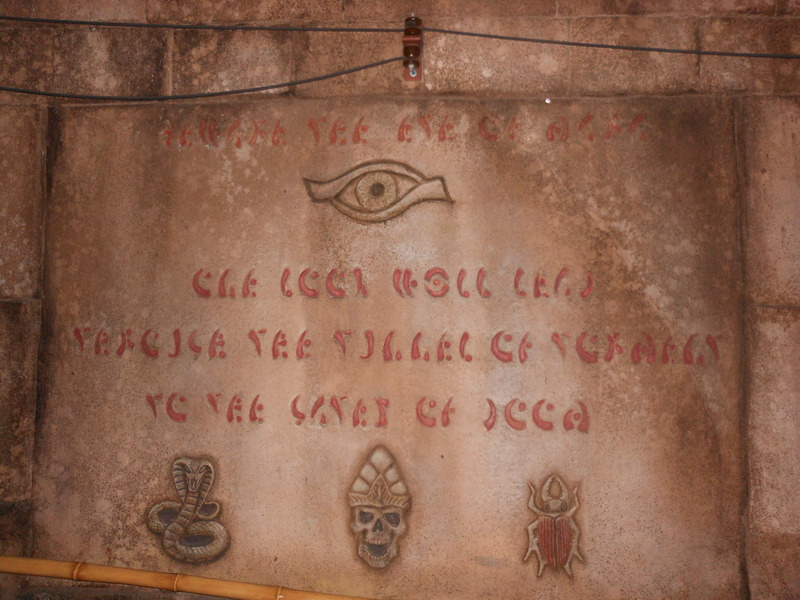 One of those expansions was in the 1990s when the thrill ride Indiana Jones Adventure: Temple of the Forbidden Eye opened in 1995. Since there was almost no more room inside the amusement park, this ride actually spills out onto the original parking lot at Disneyland. All of the original lot is now lost as it was transformed into Disney’s other theme park in Anaheim, California Adventure. 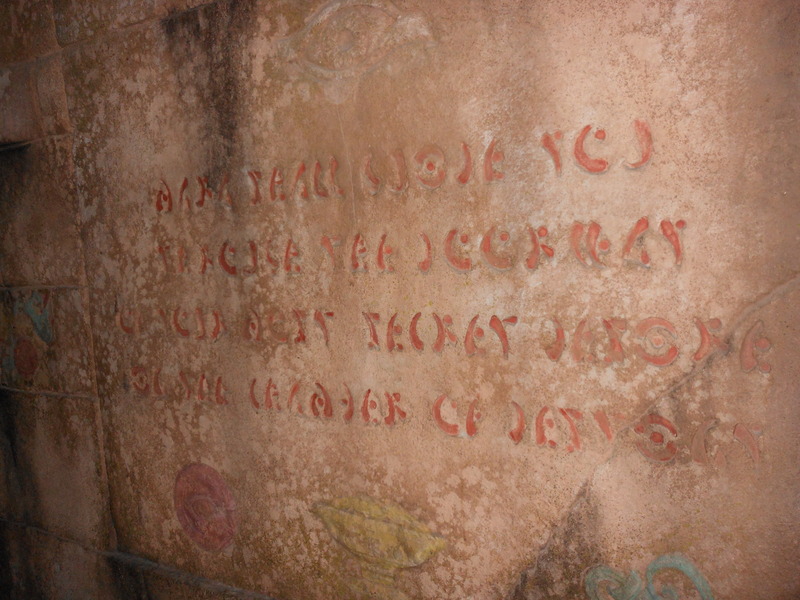 The “hidden” part of this ride comes from the glyphs that are peppered throughout the walls in the line leading to the ride. There are warnings that these messages are trying to deliver, but they are hidden. While I have no picture for it, there is one more “hidden” aspect to this ride I want to mention. As I said up top, the Indian Jones ride was built on part of the park’s original parking lot. The parking lot used to be divided into sections that were named after Disney characters. The Indiana Jones ride was built over the Eeyore section. In an homage, the designers of the ride hid an Eeyore parking sign in the ride. You have to stretch to see it, but there it is.